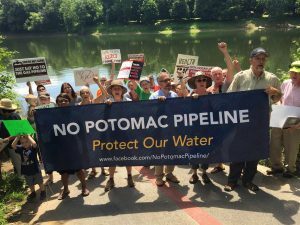 A coalition of citizen and environmental groups are calling the administration of Maryland Governor Larry Hogan to take a close look at a proposal by TransCanada unit Columbia Gas Transmission to build a gas pipeline under the Potomac River near Hancock, Maryland. The eighteen groups that signed the letter are: AMP Creeks Council, Chesapeake Climate Action Network, Chesapeake Physicians for Social Responsibility, Clean Water Action, Earthworks, Food & Water Watch, Howard County Climate Action, Interfaith Power & Light, Lower Susquehanna Riverkeeper Association, Maryland Conservation Council, Maryland Environmental Health Network, Maryland Sierra Club, Nature Abounds, Potomac Riverkeeper Network, Savage River Watershed Association, Upper Potomac Riverkeeper, Waterkeepers Chesapeake, and We Are Cove Point. “At a minimum, MDE should also examine the soil boring and geologic survey already provided by the applicant to determine what additional information it needs to understand the extent to which the applicant will be drilling through karst topography and to evaluate the potential impacts that drilling through this delicate substratum can cause,” the groups wrote. The groups also want Maryland to take into consideration the fact that the TransCanada pipeline will deliver fracked gas to a proposed Mountaineer Gas pipeline in West Virginia. The groups argued that under the Clean Water Act, the states have the right to block a federal permit under section 401.